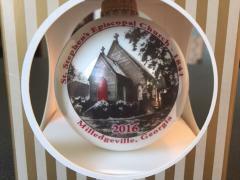 The Milledgeville Convention & Visitors Bureau is very excited to announce that the 2016 Christmas ornament is now in! 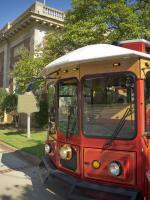 The design which adorns the 2016 ornament is the “St. Stephen’s Episcopal Church”, Built in 1841. 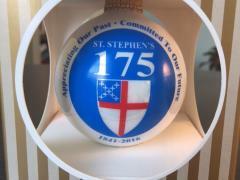 The CVB is honoring St. Stephens’s by showcasing their 175th anniversary logo on our 2016 Christmas ornament. During the brief occupation of Milledgeville by General Sherman’s forces in bitterly cold weather in late November 1864, soldiers from the 107th New York Infantry Regiment took shelter in St. Stephen’s, as well as other churches on the square. The ornaments are available for purchase at the CVB office and Grant Jewelers. Stop by and pick up this unique and limited item!